The resort location is beautiful, the staff is outstanding, food is delicious. I would highly recommend this tesort and I know I will go back again. With pristine powdery white sand beaches, tranquil turquoise waters, lush green tropical forests, and stoic gray Mayan ruins, Belize is a kaleidoscope of opportunity, waiting for you to discover its charms. 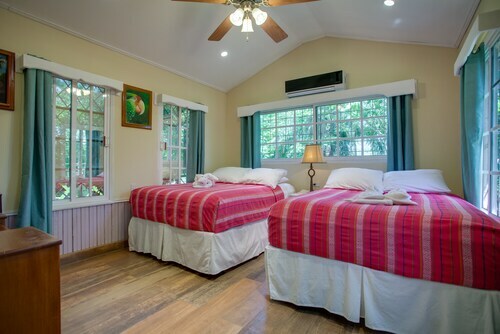 Get caught up on your beauty rest as you nap on a beach-side lounge chair with the gentle breeze tickling your neck; count the spots on a sea turtle during a scuba adventure; hike under the living canopy of trees in the Crooked Tree Wildlife Sanctuary; and channel your inner archeologist as you climb the ancient jungle temples. All of these, and more, are calling you to this Central American Caribbean paradise. And, with Belize all-inclusive hotels such as the Sleeping Giant Rainforest Lodge, the island experiences are just outside your door. Where is the best snorkeling in Belize? With all of its ancient history and enchanted rainforests, the sea is king in Belize. One of the most approachable ways to experience the underwater kingdom is by snorkeling. Along the mainland coast, Belize City, Dangriga, and Placencia are idyllic locations for snorkeling. The most popular site, though, is Amergis Caye on San Pedro Island thanks to the clearer waters in the northern part of the reef. If you go, be sure to check out the Hol Chan Cut where bigger species of fish like sharks and rays are found. The entire length of the country—nearly 200 miles—is lined by the world’s second largest barrier reef, providing ample chance to experience the aquatic rainbow of coral, tropical fish, and other marine wildlife. 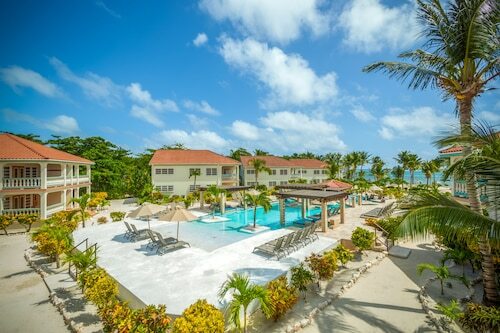 Many all-inclusive hotels in Belize, like the Matachica Resort & Spa, have snorkeling packages available for their guests, so you won’t have to go hunting for a tour guide off-property. How do you get to the Great Blue Hole in Belize? The only way to get to the underwater sinkhole—located 62 miles offshore from the mainland town of Belize City—is by boat or seaplane. With airfare costing about $200 per person, speedboat, charter rental, or group scuba tours are the cheaper ways to go. Snorkeling is, without a doubt, an enjoyable experience. However, if you want to truly experience the wonders of the Caribbean while on vacation in Belize, a scuba adventure to the Great Blue Hole—nearly 1,000 feet across and over a football field deep—is in order. The midnight blue waters stand in stark contrast to the crystal clear seas surrounding the natural oddity. Scuba divers flock to the UNESCO World Heritage Site to swim with Caribbean reef and blacktip sharks, investigate its many caverns, and underwater wonders. If your hotel does not have a scuba package to the Great Blue Hole, there are a number of water adventure outfitters on the mainland that offer them. 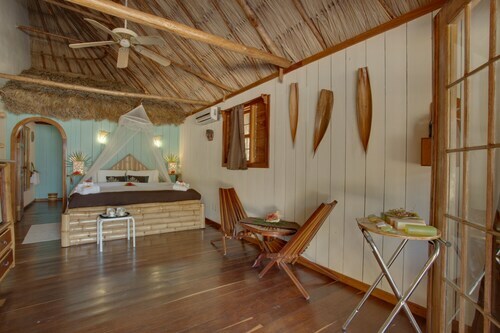 When you book your colorful Belize adventure through Travelocity, you have access to the best all-inclusive hotels in Belize. From there, it’s up to you which adventure you choose. You may select an enjoyable snorkeling jaunt in the cerulean waters close to shore followed by a more mystical dive into the cobalt deep. Or you can opt for a leisurely afternoon on the alabaster beach with your toes in the sand, a book in your hand, and your worries back home where they belong. Come and experience the wonderful colors of the rainbow firsthand.